The British Battleship HMS Warrior never fired a shot in anger and never blockaded a hostile port, yet she played a famous part in naval history. Built during the 'Pax Britannica', she served at the beginning of a revolution in technology and, like the HMS Dreadnought and USS Nautilus, the Warrior brought existing ideas forward by leaps and bounds. Her construction saw the first use of iron instead of wood for a ship's hull, the first use of watertight compartments, and the first use of heavy armor plating on a ship designed to receive such weight. With a 6.5:1 length to beam ratio, she was also by far the longest and largest warship ever built. Upon launching, it was claimed that she could have fought every known ship in the world and come away with little real damage to show for the effort. Her ability to sail in the open ocean at speeds up to 14 knots was incomparable to the Union and Confederate Ironclads built during the American Civil War. The Warrior was as well protected as the CSS Virginia, and boasted broadsides of six 100-pound Armstrong breech loading cannon, four 40-pound Armstrong breech loaders, and thirteen 68-pound smoothbore cannon. She and her sistership, the HMS Black Prince, commonly lay anchored at Spithead, their black hulls in marked contrast to the old checkered sides of the now obsolete ships-of-the-line which shared their anchorage. During the 1840's, the Royal Navy had run tests on iron plating and discovered that the brittle iron of that time shattered like glass when hit by cannon balls. The razor-like shards which shot through a ship with iron plating was unacceptable, so the technology was allowed to mature. When, in March of 1858, the French Navy ordered the ironclad Gloire and her sistership Invincible, public and private British opinion demanded a thoroughly British reply. Much like Sputnik's effect on America in the 1950's, the mere possibility of a French seagoing ironclad brought swift action from a normally conservative British Admiralty. However, because French industry was not capable of manufacturing an iron hull, the Gloire had to be built of wood protected by 4.5 inches of iron. She was a poor seaship, with a metacentric height of seven feet. Her two sisterships were built with rotten timber and had to be scrapped after a mere ten years of service. The Warrior was ordered in June, 1859. As she took shape at the Ditchburn & Mare Dockyard at Blackwall, crowds of onlookers gathered to view her building. Unlike today's world, where warship construction is treated with the utmost secrecy, Victorian Great Britain wanted the whole world to witness her might. Not that it mattered, the only companies able to build such hulls were commercial firms. Not until the construction of the IJN Yamato by Japan did nations begin hiding major naval projects from prying eyes. At left, a view from the flying bridge looking aft. The smoke stacks, ventilators and masts are at left. The port side deck battery can be seen on the right side of the picture. Her decks were slick with rain at the time of this photograph. 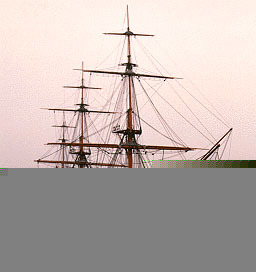 The Warrior was completed on October 10, 1860. She was protected with 4.5 inch tongue and grooved plating over 213 feet of her 420 foot long hull. Each armor plate was 15ft x 3ft and weighed four tons. She had a 57 section double bottom for 240 feet of her length, and was also subdivided into a further 35 watertight compartments amidships. She had a beam of 58 feet 4 inches and a draft of 26 feet. 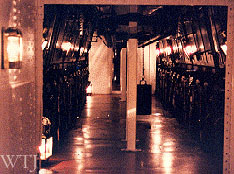 Her ten rectangular boilers (shown below right) generated 20 psi., which turned a 10 ton, 23 foot Griffith's propeller. On one occasion, Warrior made over 17 knots with combined steam and sails, an amazing feat for that time. Her propeller (that "Great Ruddy Twindler" as it was called) could be hoisted into a well above the waterline where it was held in place by large pawls. In the absence of a dockyard, it could even be hoisted up on deck for examination! The idea of propeller driven ships was certainly still in its infancy. At the time of her completion, she had no steam power outside of the engine room (except a small steam pump forward), and her anchors and cables were the heaviest ever handled manually. The anchors were hoisted by a quarterdeck capstan which needed ninety men for its operation, not to mention the ten or twenty other men needed below decks when the 'shorten in' order was given. In 1872 she was refitted with a steam capstan. 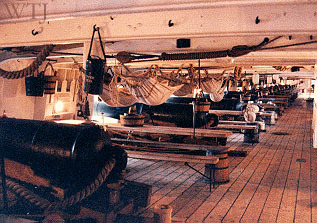 A view looking aft from the steam capstan room. In 1864, the Warrior was paid-off for refitting. Her armament was upgraded to four 8 inch and twenty-seven 7 inch muzzle loading rifled cannon and she returned to service in 1867. 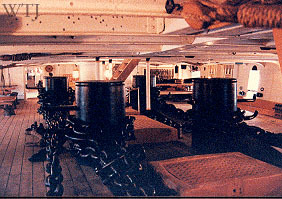 The view shown here is of her main gun deck, which was also the mess for most of the 700 men who served on board. 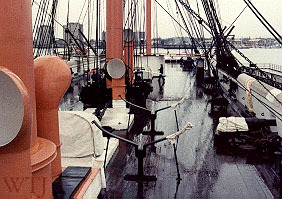 This departure from the normal practice of placing the mess one deck lower originated from the need to lower the ship's metacentric height by reducing the number of decks. 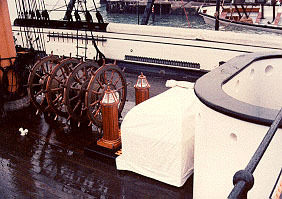 Folding wooden tables are shown in their positions between the guns. By the turn of the century the Warrior had become a floating workshop under the name Vernon III, and then was turned into a floating pontoon for oil tankers. She lay in various states of disrepair until a full restoration program was begun during the 1980's. 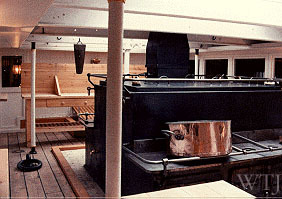 Shown here is her galley, restored along with the rest of the ship to it's original splendor. Every detail has been attended to in order to restore HMS Warrior, and she now appears just as she did at the height of her career. Her permanent mooring is at Portsmouth Navy Yard in southern England. Copyright © 1996 by The War Times Journal. All rights reserved.